Fishing, in the heart of the City, only at Albuquerque's renovated Tingley Beach. 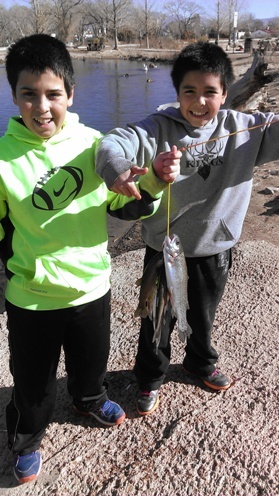 Elijah and Zachary each caught four trout in just one hour on Dec. 28, 2013. Fishing at Tingley Beach is good year-round! Tingley Beach offers fishing for anglers of all ages and abilities. Fly fishers can enjoy the Bob Gerding Catch and Release Pond. This pond is stocked once per year with large rainbow trout courtesy of the New Mexico BioPark Society. Anglers of any age can fish with baits or lures in Central Pond, and catch their limit of rainbow trout (in cooler months) or channel catfish (in warmer months). Younger anglers (age 12 and under) can also use baits or lures in the Children's Pond and keep their limit too. Both Central Pond and the Children’s Pond are stocked regularly by the New Mexico Department of Game and Fish. New Mexico state fishing rules apply to Tingley Beach. Accordingly, everyone 12 years or older must have with them a current New Mexico fishing license while fishing at Tingley. Tingley Beach South Pond is designated as a Quality Water of the State of New Mexico. Information about state Quality Waters is available from the New Mexico Department of Game and Fish's Fishing Regulations. Report violations of wildlife laws to Operation Game Thief. You can remain anonymous. Rewards are offered for information leading to criminal charges. Tingley Beach offers a unique monofilament recycling program. Look for blue and white collection tubes around the ponds. Used fishing line is sent to Berkely Fishing Supply Company to be reformed into fish habitat structures that provide a refuge for young fish and an anchor for aquatic plants. As the only site in the Southwest with a monofilament recycling program, Tingley Beach is a great example of how small actions can make a big difference for wildlife and our environment.